Circle K is built on the three pillars of service, leadership, and fellowship. Circle K is the collegiate branch of an international service organization family, founded and sponsored by Kiwanis. Circle K and the other branches of service organizations sponsored by our Kiwanis, including Builders Club, Aktion Club, K-Kids, and Key Club, all make up our K-Family. We strive to be actively involved within our K-Family! TCNJ Circle K's sponsoring Kiwanis Club is the Kiwanis Club of Ewing Township. Circle K's Motto: Live to serve, Love to Serve. I pledge to uphold the objects of Circle K International, to foster compassion and goodwill towards others through service and leadership, to develop my abilities and the abilities of all people, and to dedicate myself to the realization of mankind’s potential. Glad you asked! 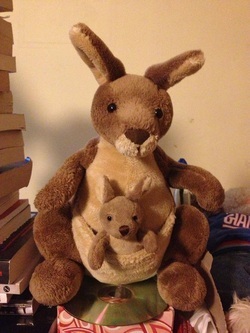 This is Kanga and Roo, our club's mascots. Every week we pass Kanga and Roo to an exceptional member. The three of you get to spend the whole week together and write how your week went in a journal. Then the next week you get to pass Kanga and Roo and the journal to a member you think is great! Hi everyone, my name is Kerri Hagan and I am a senior Deaf Education and Psychology major. I am one of the co-presidents for the 2017-2018 service year. I joined Circle K my freshman year in Fall 2014. In high school, my passion was for volunteering. I was president of interact club and volunteered for my church as a Eucharistic minister, CCD teacher, and lector. I knew that going into college, I wanted to join an organization whose main passion was for service. Once I attended a meeting, I realized that Circle K was exactly what I was looking for. As someone told me once, you come for the service and stay for the fellowship. In my free time, I enjoy going to the New Jersey Devils games, playing with my puppy, and going to concerts. If I am not doing one of those things, you can find me learning ASL or re-watching The Office. This year, I am so excited to meet all the new Circle K members! As co-president, I hope to increase the number of service projects and find new, interesting ones. One of my favorite community partners to work with is the Sunshine Foundation. In the new year, I hope to develop our relationship with them even more with doing more service projects. My favorite Circle K tenet is leadership and my favorite service project is Dreamlift. Dreamlift is a day when ill, handicapped, or abused children are sent to Disney for the day. I love working with children and it is amazing to see the excitement on their faces. Hi guys! I am Stanley Zheng. I am a senior Nursing & Public Health major and I am the other co-president. I joined Circle K my sophomore year when I was looking for more ways to get involved with community service. I knew Dawn, who was the District Lieutenant Governor at the time, and she told me about how amazing and cool Circle K was. After my first couple of meetings, I could see how everyone was so unique and passionate about service—and ultimately, that’s when I knew this was the right club for me. Some fun facts about me are that I love green tea lattes and raspberry iced chai lattes from Starbucks. I also enjoy eating Chipotle and taking pictures. I am very excited for the new events we are going to plan as an Executive Board. I also hope to bring excitement, positivity, and optimism to my position as Co-President. I have many goals that I want to achieve next year, and I need all three of these characteristics to turn these goals into reality. All three Circle K tenants are my favorite because they are intertwined within the vibrant culture of Circle K. My favorite service project is making motivational cards for students during finals. It is personally gratifying to be able to make such a positive impact on students during an extremely stressful time in the semester. ​Hi, I’m Shreya! I’m a junior Psychology major and I’m super excited to be one of your VPs this year! I joined Circle K my freshman year, and I’m so glad I did; I love being able to help the community while still making new friends and meeting new people. I love to read and binge musical soundtracks. When I find the chance, I like to try to learn something new on my piano. If that gets too frustrating, I just play something I do know and sing along. I’m super excited to get more involved in service opportunities in the coming semesters, especially (hopefully) with the American Heart Association. I hope to be a VP who is very involved with the membership, as well as someone who allows the membership to have a say in what we do as a club. My favorite Circle K tenant is definitely service because I love being able to help people and bring smiles to their faces, although I also love the fellowship that one can get from being a part of service. My favorite service project this semester was March for Babies: yeah, we were just directing parking, but the group I was with was really good at solving the problems that came our way, and adjusting the way we were doing things so that we could help things run smoothly. Hi everyone, I’m Kayla Loukides. I am a junior Psychology major with a Spanish minor and I will be one of your Vice Presidents for the service year. I joined Circle K the fall semester of my freshman year. I was heavily involved in volunteering in high school and was quick to find a new organization I could dedicate my service to. When I am not volunteering with Circle K, I dedicate some of my nights as an EMT (or newly promoted Crew Chief) for TCNJ EMS! I also work as a peer tutor at TCNJ. I really enjoy going to Dunkin Donuts because sometimes I get free things and if I go often enough, the workers there begin to know my order and well, that just makes me feel so cool. I am most excited about the e-board and general board members next year. Everyone is super involved in Circle K and enjoys going to all the events. I am excited about the new members who will join and get to be involved in their campus the way I did when I joined! I also hope to give the chairs more liberty to do what they want with their positions. As a previous chair holder, I felt like I was only allowed to do what was expected of my title. However, I want to encourage other chairs to work with each other and make this year more awesome! I would be lying if I said I did not join for the service, but I can honestly say I stayed in the Circle K for the fellowship. Everyone is eager to join in on not only service, but also our social events! We all possess the same desire to have fun while also helping out our community. ​​Hello! My name is Aakhila Rameeza and I am a senior Biomedical Engineering major. I am the Treasurer of TCNJ Circle K. I joined Circle K my freshman year of college. I was very involved in Key Club in high school so I was excited to get involved in the college division of Kiwanis. Some activities I like to do on my spare time are watch TV and play tennis or basketball. During my senior year, I look forward to meeting new members and creating a greater presence of Circle K on TCNJ's campus. I hope to help organize more fundraisers so the club can have larger events and give more back to the community. My favorite Circle K tenant is service. I volunteer in the ER of a local hospital every weekend, and my favorite service project is Dreamlift. Hello my name is Maggie Nese! I am a senior Accounting major and am so excited to be secretary for the new service year. I joined Circle K during my first semester freshman year. I’ve been involved with community service since I was young, as I was a Girl Scout for 13 years, and was looking for a community service club to join at college. At my first Circle K meeting, I felt so welcomed, and I have loved it ever since! Something interesting about me is that I am an identical twin. My favorite TV shows are Mad Men, Shameless, and Broad City. I also love bagels! When I’m not doing service, you can find me: drinking coffee, going to the gym, or going to concerts. For the upcoming service year, I’m most excited to work with the new E-Board to plan new service projects! Although I was secretary last year, I hope to bring enthusiasm to my position and use what I learned as secretary to improve my abilities. My favorite tenant of Circle K is fellowship because I love getting to know everyone in the club through participating in service projects and being a leader of the club! My favorite service project I’ve participated in was building a playground in Ewing with Kiwanis and Key Club members. ​Hello everyone! My name is Kathleen and I am so happy to be the editor for TCNJ’s chapter of Circle K. I am a senior Communication Studies major with a minor in Marketing and I absolutely love doing community service. I joined Circle K my sophomore year because I wanted to foster my love of service and meet new people who also liked helping others. When I am not talking about Circle K or doing service, you can find me listening to music, hanging out with my friends, or going on walks around campus. As editor, I hope to create awesome newsletters and revamp our club's website. I am also excited to recruit new members and participate in more campus-wide service projects. One project that I really enjoyed working on was serving food to the homeless at St. Mary’s church in Trenton. We had such a great time and were able to positively impact many peoples' lives. While I love being on the executive board and creating life-long friendships, I would have to say that service is my favorite Circle K tenant. Hi! My name is Maggie, and I'm a senior English & Women's, Gender, and Sexuality Studies double major! I'm one of this year's Social Chairs, and I can't wait to plan awesome events that will help members bond and make friends (all while doing service too!). I joined Circle K in freshman year because I wanted a cool group of people to hang out with and I wanted to create lasting change by helping others through different school/community service projects. When I'm not doing service, I like to read (religiously! ), attend various concerts, and watch TV. I hope to make events that will help buddies get closer and that will just be an all-around fun time!! My favorite tenant of Circle K is service and fellowship because why not try to change the world with some friends by your side??? My favorite service project is Dreamlift, and my favorite weekly project is TASK Utensil Wrapping. That's enough exclamation points for now, can't wait to meet everyone!! My name is Jaime Gehringer and I’m a sophomore majoring in Communication Studies and minoring in French and Marketing. I am also one of Circle K’s social chairs for this year! I joined Circle K my freshman year because I wanted to give back to a new community that was so welcoming of me and so opportunistic. Other than serving my communities, I enjoy attending concerts, drawing, writing, and playing the keyboard or ukulele in my free time. This year I hope to draw all new and old members even closer together through fun bonding activities so that we can share our passions for service and leadership while building friendships along the way. Out of all the tenants of Circle K, service is my most favorite because it is the most selfless of the three. Giving back to my community is very important to me because I believe that the places and people who surround us play a large part in shaping our lives, and I want everyone to have equal opportunities to succeed and flourish. My favorite service project that Circle K engages in is Dreamlift, and I cannot wait to partake in the project again this year! Hi! My name is Meghan Harrington and I am a senior Communications major. This year I am serving as one of the fundraising chairs. I joined Circle K when I was a freshman at Rowan University in September of 2014. I always loved volunteering and was a very active Girl Scout growing up, so I knew I would want to join a club that is completely dedicated to volunteering as soon as I started college. When I am not volunteering, I really like to watch Law and Order: SVU and hang out with my friends. I am hoping to have a very fun and successful year along with my fundraising co-chair. We already have several fundraisers planned for this semester. I think my favorite tenant of Circle K is service. Although leadership and fellowship are also very important, at its heart, Circle K is a service organization. My favorite service project is anything where we are helping people firsthand, like trips to the local soup kitchen or Dreamlift. My name is Sachith Seneviratne and I’m Circle K’s co-fundraising chair. I’m a senior psychology major (and soon to also be an accounting major). I joined Circle K last semester as I really wanted to be more involved in the community and this club seemed like the perfect opportunity to do so. Some fun facts about me: I love swimming and taking my dog on walks, and my favorite food of all time is sushi. As co-Fundraising Chair, I hope to bring some new fundraising ideas to the table and really get people involved in our events. I myself have had prior experience in fundraising so it will be interesting to see how it could help in Circle K. Of the Circle K tenants, I think my favorite is service. My favorite service project so far would have to be the blood drive. My name is Bailey Falco. I am a psychology major and women, gender, and sexualitites studies minor, and the historian co-chair. I joined Circle K last year when I transferred to TCNJ, and I joined because of my love for being involved in the community I belong to and the club was welcoming and friendly. Some fun facts about me are that I am currently training for a half marathon, I love 1960’s french cinema, and I am afraid of asparagus. I hope to bring creativity to my new position as historian co-chair. My favorite Circle K tenant is leadership, for it is something I strive to improve on continuously. Lastly, my favorite service project was the amalgamation of projects we did at our fall social. Hi my name is Amanda D'Alessandro and I am a sophomore Criminology major. This year I will be serving as one of club's historians. I joined Circle K my freshman year because I was involved in my high school's Key Club. I was also interested in meeting people who wanted to help the community. My favorite things to do are playing soccer and video games. Two fun facts about me are that I am a chicken nugget enthusiast and can name all the states in alphabetical order by singing a song. As historian, I want to record and preserve our events through pictures and videos and create a recruitment video. My favorite Circle K tenant is fellowship! I love getting to talk with all my Circle K peeps :D. My favorite service project is Terhune Orchards because it both helps our club and a business that provides freshly grown produce to the community. My name is Eileen. I’m a senior biology major, and I am the Membership and Development Co-Chair with Kristin! I joined Circle K my freshman year because I was actually the president of my Key Club in high school and I wanted to continue volunteering with Kiwanis. I hope to create a welcoming environment to all our new members and show them how dedicated and passionate our organization is. My favorite Circle K tenant has to be service because our passion for service is what brings us all together. I have made so many lifelong friends in Circle K and it felt natural to step up and serve as a committee chair for the past 3 years, so ultimately service led to fellowship and leadership. My favorite service project was serving hot meals to the community of Trenton at St. Mary’s Cathedral. When I’m not doing service, I am probably studying but I love making time to de-stress by playing the piano, guitar, and ukulele! Hi everyone! I'm Kristin and I'm a senior psychology major with a minor it sociology. I transferred to TCNJ during my junior year and really wanted to find a club to get involved. As soon as I went to my first Circle K meeting, I knew I had found my place. I'm so excited this year to be a Membership Development and Education Co-Chair and Ilook forward to hanging out will all our current and new members for another year. Hey everyone! My name is Alyssa and I am Circle K's Relay For Life Chair this year. I am a sophomore, English-Secondary Education major and I joined Circle K last year as a freshman to get involved with service on campus and in the Ewing community. Service is my favorite Circle K tenant because it is something that I have always been really passionate about and I am grateful that Circle K has helped me continue to make service a big part of my life in college. My favorite service project that we did last year as a club was going to the Food Pantry where we helped them sort through all of the donations that they had collected. When I am not volunteering, you can probably find me reading or running. I am very excited for this year and hoping to pump everyone up for Relay For Life in the Spring! ​Hi, my name is Shivani Shah, and I am a senior industrial/organizational psychology major. I'm currently serving as the Service Chair for Circle K, along with Stuti Parikh. I joined Circle K my freshman year because I was an active member of Key Club in high school. I knew that I wanted to continue being a part of an organization dedicated to helping others in college. In my free time, I usually watch Netflix or listen to music. I hope that I can bring new and innovative service projects into the organization to keep members active and engaged. My favorite Circle K tenant would have to be service because it really has showed me how big of an impact we can have in the world. My favorite service project is definitely PB&J making for TASK, because it's fun and easy, but really makes a huge difference! ​Hi my name is Stuti Parikh and I am a senior Biology major. I am service chair for Circle K. I joined circle K in my sophomore year because it seemed like a great club where I would be able to volunteer and also meet new people. A fun fact about me is that I love trying new foods! As service chair, I hope to find new volunteering opportunities around Ewing and Trenton that will benefit the society as a whole. My favorite tenants are service and fellowship because I believe providing service to the community is very important aspect in life and this cannot be done without making connections and meeting new people. My favorite service project so far was organizing food items at Mercer Street Friends Food Bank! Hello, I am Michelle Yong, and I am a senior finance major. This semester, I am happy to be the alumni chair. I was actually one of the first alumni co-chairs when this position first began two years ago. I hope to maintain and expand the interactions between the alumni and current members by developing an online alumni directory. I have been in Circle K since my freshmen year, and I joined because I like staying active and giving back to the community. I was also in Key Club in high school. My favorite circle K tenant is fellowship as this organization unites people of various backgrounds and views together. My favorite service project is either utensil wrapping for the Trenton Area Soup Kitchen or coupon clipping for soldiers as these were some of the first volunteer opportunities I did as a freshman. Some of my hobbies include hiking, reading, cooking, and kayaking. Please feel free to contact me with any questions.Thank you, and I am looking forward to meeting the new members! Hi, my name is Mya Lynch, I’m sophomore and I am a Music Performance major currently switching to become a Music Education major at The College of New Jersey. I joined Circle K International because, other than the fact that I had experience being a member and Treasurer of Key Club in high school, I love service and the idea of several people coming together to do good. The things I enjoy outside of volunteering are, of course being a music major, playing flute, piccolo, and singing. I also like to hike, do yoga, play softball and basketball, and eat mac & cheese and ice cream. As the new Kiwanis chair, I intend to maintain the great relationship that we, as TCNJ Circle K International, have with the Ewing Kiwanis members and I hope to meet and learn even more about their organization through the multiple volunteering opportunities I’ll hope to attend in the future. Out of the three Circle K tenants: service, leadership, and fellowship, my favorite is service because, like I touched upon earlier, I believe that through the process of participating in community activities and with outside service organizations will come the leadership opportunities and fellow peers with common good intentions. One of my many favorite service projects with CKI, was called Dream Lift, where service group members from different colleges and high schools came together and helped with the organization process of sending special needs children and their guardians to Disney World for an entire day. Although this project required me to be a morning person, I loved working with the other volunteers and most importantly dancing and singing to Disney songs with the kids as we awaited for the plane to be boarded. Hi everyone! My name is Shannon Leckie, I am a senior Special Education and History major with a Communication Disorders minor. I am so excited to serve as the Key Club chair for the 2017-2018 school year! I joined Circle K my freshman year because I loved being in Key Club in high school and I wanted to continue working on service projects with a wonderful group of people. I am incredibly excited to work with high school students in Key Club and I hope to implement new service projects that we can collaborate on. My favorite Circle K tenant is service because through service we showcase our leadership abilities as well as create friendships with the people we are working with. My favorite service project is Relay for Life because so many people come together to raise money to continue the fight against cancer, as well as to honor and remember people with cancer. A fun fact about me is that I tried a cappuccino for the first time this summer and now I’m addicted! I look forward to a great year working with all of you! Take a blast into the past! Thanks to some extraordinary snooping, we have a comprehensive list of the executive board from TCNJ Circle dating all the way back to 1982! The committee chairs held were: Kaitlin McCann, K-Family; Katrina Martinez, Membership Development and Education, and Publicity; Lorraine Johnson, Social and Fellowship; Heather McBride, Fundraising; Laura Fischer, Service; and Tammy Tibbetts, Webmaster. Laurie Nobile served as the NJ District Fundraising Chair. Kim Greene won a Circle K International Matching Scholarship. Trenton State Circle K hosted FLIP, the Fall Leadership Instructional Program. District officers in the club include District Governor, Michael Olivo; District Secretary, Colleen Folcher; Lt. Governor, Meggin Winters; Brother/Sister District Chair, Holly Spriggs; Fundraising Chair, Jeff Ziliani, and Membership Development and Education Chair, Melanie Cushman. At District Convention, TSC CKI received 1st place for Single Service, 2nd place for Club Achievement, 3rd place for Scrapbook, the K-Family Relations Award, and seven Club of the Months. Karen Schick was selected as Outstanding Vice-President, Holly Spriggs received Outstanding Editor, Colleen Folcher was selected as the Outstanding District Board Member, Jeff Ziliani received Outstanding District Administrative Assistant, and Amily Beidelman received the Outstanding Member of the Year Award. International Convention was held in Phoenix, Arizona this year. At the convention TSC Circle K received 1st Place for Overall Club Achievement in the Silver Division, and 4th Place Membership Growth in the Emerald Division. Colleen Folcher received the Distinguished District Secretary Award and Holly Spriggs received 1st Honorable Mention Outstanding Club Newsletter. The New Jersey District won the "most people-miles" award again this year. Our club hosted the District Rally. Karen Stocker was District Governor from April to September. Melissa Palfy was Lt. Governor. Chris Cinowski was Insight Chair and Kelly McCracken was District Convention Go-Chair. At Convention, TSC won 2nd Place for Single Service, 2nd Place for Scrapbook, and 1st Place for Overall Club Achievement. This year's International Convention was in San Antonio, Texas, where TSC's s Scrapbook won 3rd Place!!! Kim Strauch also won Outstanding Newsletter for the District and we brought home the "most people-miles" award!! Ed Hayden was the Lt. Governor this year. The club held the WPST Dance again this year. At Convention, TSC received the award for Outstanding Newsletter, 2nd Place for Achievement, 2nd Place for Single Service, 2nd Place for Scrapbook, and Keith Layton was elected Outstanding Circle K'er. The District Officers for this year were Debbie Steiner, District Treasurer; John Bastion, Lt. Governor (April - December); Jean-Marie Curran, Lt. Governor (December - April). There was another Variety Show, and again, visits to Head Start from Santa and the Easter Bunny. TSC Circle K hosted the Lt. Governor elections. Santa and the TSC club visited the Head Start Program. The Easter Bunny also visited the Head Start Program. The committee chairs held were: Megan Henner, K-Family; Steven San Filippo, Membership Development and Education; Dyana Reisen, Social and Fellowship; Stephanie Zitelli, Fundraising; Katrina Verendia, Scrapbooking; and Becky Barrett, Service. District Officers include Stephanie Mindzak, Lt. Governor, Division 1; Kathleen Hart, Presidents’ Council Administrative Assistant; Teresa Staples, District Convention A.A., Danielle Pelletier, Insight A.A.; and Sara Harvell, MD&E A.A. We hosted the District’s Midwinter Training Conference. New Jersey had two Trustees, Sergio Negrin and Ed Collins, and the International Secretary (IS), Kim Scharoff, elected to the International Board. The IS, who is originally from NY, transferred to our very own TCNJ to do her graduate studies. This year, TSC CKI hosted a Pizza Chat where everyone signed everyone else's T-shirt's with permanent marker. District officers in the club this year include Acting District Secretary (December), Meggin Winters; District Secretary (January - March), Colleen Folcher; District Treasurer, Michael Olivo; District Editor, Meggin Winters; Lt. Governor, Gregg Ziliani; District Convention Chair, Kim Bolton; Insight Chair, Jessica DePascale; President's Council Chair, Craig Frame. At District Convention, TSC won Ist Place for Overall Club Achievement, Single Service, and Scrapbook. Jeff Ziliani won Outstanding Circle K'er, Melanie Cushman won the Essay Contest, and Meggin Winters won Outstanding Board Member. TSC also had several acts in the Talent Show including the winning act by our Faculty Advisor, Rosallie Bender for her rendition of Second Hand Rose. International Convention this year was in St. Louis, Missouri where TSC Circle K won 2nd Place for Overall Club Achievement in the Silver Division, Ist Place for Outstanding K-Family Relations, and New Jersey as a whole won the "most people-miles" award and Outstanding District Publication. Maureen O'Keefe was District Governor, Karen Stocker was District Secretary, and Chris Cinowski was Lt. Governor. This year, the club experienced a major membership growth. This year was the First Annual Veterans Day Ceremony. At Convention, the club won Ist Place for Single Service with Woman Space. TSC also received Ist Place for Scrapbook, 2nd Place for Achievement, Mike Bass received Outstanding Circle K'er, Dave Rose received Outstanding Kiwanis Advisor, Rosallie Bender received Outstanding Faculty Advisor, and the club was recognized for earning the most service hours. District Officers for this year were Jackie Gilisano, District Governor; Jean-Marie Curran, District Secretary; Jeff Newman, District Convention Chair; Sandra Vincent, District Editor. Trenton State Circle K hosted the Spring Trainer and Convention. The club held a WPST - Family Food Fund Dance. At Convention this year, the club placed for Achievement, Scrapbook, and Single Service. TSC hosted the Spring Trainer and District Convention. Another Bowl-A-Then was held, along with a Variety show. At Convention, TSC won Outstanding Newsletter Award, 2nd Place Scrapbook, 2nd Place Single Service Award, and 2nd Place Achievement Award. Also at Convention, Debbie Steiner was named Outstanding Lieutenant Governor. This was the year for the major TSC and Seton Hall rivalry. Santa and the Easter Bunny visited Head Start again. The committee chairs held were: Kaitlin McCann, K-Family; Jen Esmart, Membership Development and Education; Lili Daniel, Social and Fellowship, and Webmaster; Elizabeth Houwen, Fundraising; Janine Turrise, Scrapbooking; and Jessica Ovadia, Service. Laurie Nobile was elected NJ District Board Treasurer and Nicole Deeney was elected Lt. Governor. In Dec. 2002, Circle K was awarded the TCNJ Student Life Award for the FACT Program completed in the Spring of 2002. TCNJ Circle K won First Place at DCON for their scrapbook, committee headed by Lorraine Johnson. New Advisor - Dr. John Krimmel of the Criminal Justice department. (April-November) Chris Lasko (January -March) TSC CKI became TCNJ/TSC CKI due to the name change of the college to The College of New Jersey. The club hosted District Rally. It celebrated its 15th anniversary dinner on March 8th. An Alumni Association was formed. The District Officers in the club included District Secretary, Karen Schick; District Treasurer, Jeff Ziliani; Division 1 Lieutenant Governor, Stephanie Mindzak; Immediate Past Governor/District K-family Chair, Holly Spriggs. At International Convention, Jeff Ziliani won the R.P. "Reg" Merridew Distinguished Treasurer Award. Our Lt. Governor Stephanie won the Jay N. Emerson Distinguished Lt. Governor's Awaed. The Club won the First Place Scrapbook Award, under Nicole Favale, and we won First Place in the Silver Division of Club Acheivement. Our new inductees into the Society of Distinguished Collegians were Kathleen Hart, Holly Spriggs, and Jeff Ziliani. Kathleen Hart also won the Circle K International Matching Scholarship. Our club hosted Division II Lt. Governor elections, and District Convention in Mahwah, NJ. Michael Olivo was District Treasurer, and Kim Strauch was District Editor. Kristin Chamberlin and Kim Bolton were District M. D & E. Go-Chairs, Jessica DePascale was District Convention Chair, and Jen Vojtasko was District K-Family Chair. At District Convention, TSC won 2nd Place in Overall Club Achievement and 3rd Place for Scrapbook. We also received Outstanding Vice-President, Secretary, Treasurer, and Editor. At the convention's Talent Contest, Craig Frame and James Falvo won 1st Place for their rendition of "Losing My Religion"--unplugged. TSC's Kelly Forczek won the oratorical and essay contests. We received Early Bird Dues, Dues on Time, and all 9 Club of the Month Ribbons. Our advisor, RosallieBender, also received Outstanding Faculty Advisor. This year's International Convention was in Nashville, Tennessee. At International Convention, we brought home 3rd Place for Overall Club Achievement in the Silver Division and 1st Place for Membership Growth in the Emerald Division. We also won the "most people miles" award and Craig and James performed once again in the International Talent Show. Maureen O'Keefe was Lt. Governor at Large this year. TSC Circle K placed 1st at District Convention for our Single Service Project, the Trenton Psychiatric Hospital. The club hosted a Pizza Chat. The District Officers for this year were Jackie Gilisono, District Secretary; Jean-Marie Curran, Lt. Governor. Again, Santa and the Easter Bunny visited the head Start Program. A Bowl-A-Then also took place for a charity.